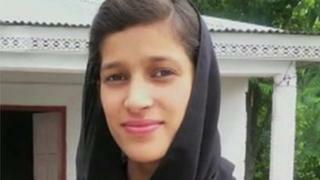 Maria Sadaqat's family say she was attacked and set on fire at her home in Murree after turning down a suitor. Local police arrested four men - but later said the case was a suicide and released the men on bail. The investigation was "flawed" and the death had been painted "as suicide rather than murder", the mission said. Ms Sadaqat gave statements to the police in hospital, naming several men as her attackers, before she died on 1 June. Police initially arrested four men, including the owner of a school where Ms Sadaqat taught not far from the capital Islamabad. Ms Sadaqat's family said the attackers had wanted revenge because she had rejected a marriage proposal from the school owner's son, because he was already married with a child. However, a police investigation concluded a month later that the victim had taken her own life, leading to the release of the suspects on bail. On Wednesday, a committee by the Supreme Court Bar Association said Ms Sadaqat could not have committed suicide and that the nature of her burn injuries suggested she had been attacked. "Neither Maria's hands were burnt nor her feet were burnt," Supreme Court Bar President Ali Zafar told reporters, adding that this matched her statement where she said she had been held to the ground by four men. The fact finding panel had gathered information from the scene of the attack and interviewed family members, doctors and police. Its report also suggests that there had been a campaign of "character assassination" against the victim and her family, probably in an effort to silence them. "The mission strongly feels that flawed investigations encourage crimes against women and this is one of the reasons that honour killings are on the rise," the report said. Nearly 1,100 women were killed in so-called honour killings in Pakistan last year, the country's independent Human Rights Commission says. Violence against women is common in Pakistan and is often connected to a perceived slight or loss of honour, as is alleged to have occurred in Maria Sadaqat's case. Often such violence goes unreported - and most of it takes place within the family. In many cases - although not in Maria Sadaqat's - relatives hoping to keep the family name out of the news prefer to make out-of-court settlements. Punjab province, where the attack on her happened, passed a landmark law in February criminalising all forms of violence against women. However, more than 30 religious groups, including all the mainstream Islamic political parties, threatened to launch protests if the law was not repealed. Why is bill to protect women unpopular?